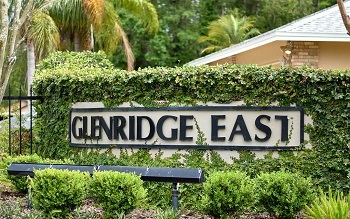 The eye-catching, gated community of Glenridge East in Palm Harbor, FL. offers single family homes for sale set among serene ponds, and backs to the 8,000 acre Brooker Creek Preserve. Located from East Lake Rd, to the end of Ridgemoor, Glenridge East neighborhood has affordable homes, ranging from roughly 1800 to approximately 2600 sq. ft. and more. The single story homes have impressive floor plans such as large eating spaces in kitchen, family rooms with an stone fireplaces, separate formal dining and living rooms with split three and four bedroom plans, cathedral/vaulted ceiling, ceiling fans, hot tub/spa, inside utility, volume ceilings and large walk-in closets. Many have spacious covered patios and beautiful in-ground pools to extend the living space to the outdoor area and feature two and three+ car garages for loads of storage. Just minutes away from shopping, John Chesnut Park, the Pinellas Trail, Ridgemoor's central park with playground, tennis and basketball courts. A short commute to Tampa International Airport and Clearwater/St. Pete Airport, downtown Tampa, Clearwater and St. Petersburg. Selling your home in Palm Harbor can be a stress free experience. Let our team of dedicated experts arm you with the tools and knowledge you need. Call us at 727-314-1000. We have been helping sellers in Palm Harbor since 2002. Also, be sure to ask for details our flexible commission structure which gives you maximum control over the sales process. Ask About Our Flexible Selling Commissions!